MOBILITY 2035 THE DISCUSSION--The City of Los Angeles has taken an historical turnabout in placing higher priority on people than cars in its recently passed Mobility Plan 2035.Its Vision Zero goal is to eliminate traffic fatalities; something we have always just assumed was a fair price for transporting ourselves. As a long-time critic of an autocentric Department of Transportation (DOT), for the first time I can now say I am very proud of DOT, our Planning Department and our City. Mobility Plan 2035 calls for many new miles of bus lanes, protected bike lanes and pedestrian safety improvements. We’ll have new ways of getting around. Safety comes first in this plan, even if it comes at the expense of slowing cars. It seems so logical, but it took us way too long to conclude that people’s lives are more important that saving motorists five or ten seconds. Mobility Plan 2035 recognizes that we have to address climate change, health, safety, and overall livability. Planning our city for people does that. Planning for automobility undermines all of those goals. While I believe that addressing climate change is the most urgent of these, I first want to focus on livability. Think of our favorite cities -- Santa Monica, Santa Barbara, San Francisco, Boston, Washington DC, Barcelona, Paris – they are places that put people first. You can walk, bicycle or take transit. But having not sacrificed the soul of these places to the auto leaves them livable, interesting, rich in architecture, and places you’d want to live or visit. Now think of the cities that place the auto first – suburban San Bernardino County (or much of southern California for that matter), Phoenix or Houston. Are these places you want to visit on the weekends, take your out of town visitors to show, or go to on vacation? Would you choose to live there? I doubt it. When we plan our city so that it is safe for an 8-year old boy to walk to school, or our 80-year old mother to walk to the store, we plan a city that is good for people. When we make it safe to bicycle to work, we plan a healthy city where Type II diabetes and premature heart ailments are kept in check. When we make it convenient to use public transit, we clean our air and reduce the threat of climate change. When we plan this way, we plan a safe, healthy, livable, sustainable community. That’s what Mobility Plan 2035 is about. Detractors are already complaining about congestion that might result from the Plan. As if congestion is our greatest worry. This may be a shocker to some, but congestion shouldn’t be our greatest concern. When it is, we just seek ways to keep the cars moving at the expense of all of our other community goals. Some people are threatening to sue. These are the same people who scream about traffic congestion, and are the ones who fight attempts to provide attractive alternatives so that we don’t have to be stuck in congestion. You can’t complain about congestion, and at the same time, complain about providing options to driving. 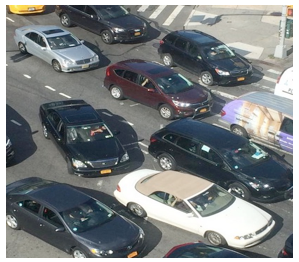 Let’s be clear about one thing – it’s the cars that cause the congestion. It’s not bicycles, buses or people walking. It’s cars. One person taking up 150 square feet of street space wherever they go causes congestion. Let’s be clear about another thing. Each of us driving around with two tons of steel never was a sustainable transportation mode. Cars are largely responsible for climate change and this is the greatest threat to humankind. 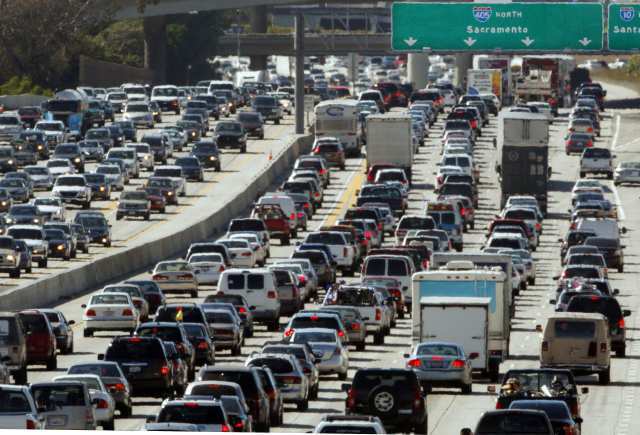 Tiny concerns over traffic congestion pale in comparison to the destruction of human habitability that awaits us from climate change if we keep our heads in the sand and fail to address it with great urgency. With the drought in California we have come to see that we are all responsible to do our part in reducing our water use. We have to adopt the same mentality when it comes to driving. We all need to do our part to carpool, walk, take the bus, or bicycle when we can. We need more attractive transportation options in order for more of us to use other modes. We should embrace these options, not fight them. Most disturbing are the City Councilmembers who want to gut the Mobility Plan out of concerns over traffic congestion. Paul Koretz wants to take bike lanes off of Westwood Boulevard, the street leading into UCLA. A plan has been sent to Koretz’s office that shows that bike lanes could be added to Westwood Boulevard without removing any travel lanes or parking. No skin off of anyone’s nose. Despite widespread community support for the bike lanes, Koretz is carrying water for a small group of well-heeled homeowner association leaders that don’t want people on bicycles in their way when they drive. These are the same people who convinced him to remove the bus lanes from Wilshire Boulevard in their neighborhood. Councilmember Koretz simultaneously talks about the urgency of climate change, but his actions show he really cares more about re-election and he believes these people are key to that. 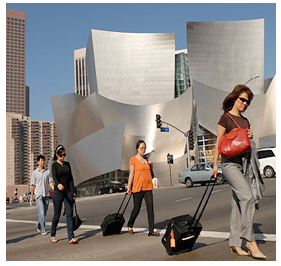 Los Angeles is poised to move into the next era of transportation planning. It’s one that can leave us a safer, healthier, sustainable and more livable city. I hope the City Council has the wisdom to keep Mobility Plan 2035 in tact when a few Councilmembers look to appease the old guard. MP2035 exposes itself as a false “mobility” plan from the start. It states point blank that reducing traffic congestion is not its goal. For the vast, vast, vast majority of us in this City, being stuck in traffic is the precise opposite of mobility and that is what this plan promises to do – stick us in more traffic. In fact, this so-called mobility plan states (and in fact relies on the fact) that it will increase traffic congestion by, among other things, removing traffic lanes used by cars for buses and bikes. Far from trying to reduce traffic congestion, the (mostly unstated) theory is that if traffic congestion becomes SO unbearable (even more than it already is) it will magically force people to take other forms of transit – whether they exist or not, are convenient or not or are economical or not. Removing traffic lanes for the overwhelming bulk of traffic (see US Census chart at the bottom) decreases the capacity of the street. This not only creates longer commutes, but also forces drivers to seek alternative routes which, according the MP2035, will be right through residential neighborhoods. That’s the kind of logic that tells you the best way to save a drop of water is to approve huge development projects that consume tens of millions of gallons of water, or that the best way to put out a fire is to douse it with gasoline. This is not Fix The City’s opinion or analysis. This is the City’s analysis. Strange: None of those speaking in support of MP2035 highlighted this conclusion, though one council member dismissed any negative conclusions as “worst-case scenarios needed to avoid legal challenges.” Given that the council must base their decision on substantial evidence presented in the MP2035 study, such unsubstantiated conclusions may be hard to defend. Perhaps most troubling is the last “unavoidable significant adverse impacts“ mentioned above: That increasing traffic congestion on major streets not only slows regular traffic down, but it slows down emergency response vehicles. Again, this too is admitted by the MP2035 plan. In 2012, Fix The City’s data analysis exposed (first through KNBC and then extensively in the LA Times) that LAFD response times were falling short – way short, of the City’s stated metric of arrival within 5 minutes after dispatch, 90% of the time. At that time councilmembers were outraged. They promised immediate action to improve this most basic service: Ensuring the safety of the City’s residents. Since that time, response times have gotten worse and worse with the 5 minute/90% metric falling to under 60% for the City overall. This last year the City Council congratulated itself for “addressing the problem” by including hiring in the current budget for the first time in years. Unfortunately, not only is the approved hiring not even sufficient to replace firefighters lost to attrition, it does nothing to replace firefighters lost in previous years or to increase the number of firefighters needed to deal with increased population and density – and now decreased mobility for first responders. Instead of doing what it takes to improve response times, the Council has approved a plan that admits it will harm response times. To Fix The City, this is simply unacceptable. Even more unacceptable is that certain council members hailed the plan as improving safety when the text of the plan and the plan’s analysis yields the opposite conclusion. Even more callous is the public description of MP2035 has being one that increases public safety when the City’s own admissions show the reverse. Below the surface, it is the hidden agenda of the MP2035 plan that links traffic congestion, emergency response times and consumption of other key resources such as water: The drive for increased density – even though the City cannot handle its current density. Far more than being a mobility plan, MP2035 is actually a development-enablement plan which will have a dramatic effect on increased density in the City with all of its impacts. To combat troublesome neighborhoods from raising concerns about local impacts and the livability of their neighborhoods, the State legislature passed several laws granting expedited review or exemption from certain review for projects near transit (oddly just like the transit proposed by MP2035). Chief among these is SB743 which states “This bill would provide that aesthetic and parking impacts of a residential, mixed-use residential, or employment center project, as defined, on an infill site, as defined, within a transit priority area, as defined, shall not be considered significant impacts on the environment.” Tell that to the people that live in that environment. AB744 provides for density bonuses within 1/2 mile of a major transit stop (which is pretty much everywhere once MP2035 is implemented). MP2035 studied none of this growth-inducing impact, nor did it study the increased funding for “transit-oriented development” that may result from non-City sources. What should further frustrate this City’s residents is that far from being a representative democracy in which our council members are allowed to represent their area’s interests, this City is increasingly run by a very few people who were not elected by those their decisions impact. The recent Council vote on MP2035 had Council Members Koretz and Cedillo asking for modifications of the plan in their areas. In theory, those council members were elected by those voters to represent them and their interests. It is expected that council members will have the ability to impact policy in their own districts. Instead, other council members ignored their colleagues. Oddly, the elected class then wonders why voting in this City has declined to such low levels. Why take the time to vote for council members if they can’t impact policy in their own districts? We also wonder if the Council truly understands that AB2245 exempts the City/LADOT from having to conduct ANY further study for bike lane restriping once MP2035 is installed. AB2245 “exempts from CEQA the restriping of streets and highways for bicycle lanes in an urbanized area that is consistent with a prepared bicycle transportation plan.” No doubt there will be battles over what “restriping” is as the City attempts to shoehorn MP2035 projects into AB2245. There is another troubling and misleading conclusion presented by the City: That MP2035 will reduce pollution. It is well established in the literature, and in common sense, that increasing congestion and therefore the time vehicles are operating leads to increasing air pollution. 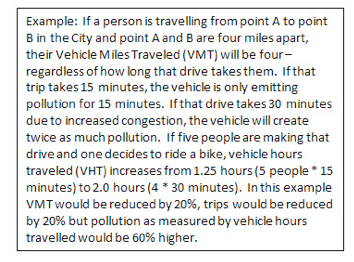 Given that motor vehicles of all types represent the bulk of trips in the City, there truly is no other conclusion other than one that states the obvious: Increased congestion for motor vehicles will worsen air quality. The basic focus of “LOS” is to determine local impacts on intersections near a development project based on how free-flowing traffic is through that intersection. LOS A means no traffic/free flow, LOS F means traffic jams/no mobility. A huge project that creates 10,000 new trips per day would clearly impact local traffic in the area around the project. It was getting harder and harder to justify building new mega-projects in areas with LOS F gridlocked traffic. This analysis has annoyed pro-density forces as it had the nasty side effect of showing huge impacts on residents, businesses and neighborhoods near the project. This made for bad politics. So, what is the solution for pesky analyses that show negative local impacts? You simply need to pull back a bit and look at the larger(and unprovable) picture until you are so far away that local neighborhood impacts can no longer be seen. A plan such as MP2035 that will have major negative local impacts would merely try to do some fancy footwork to claim that because of unmeasurable efficiencies, overall regional VMT will be reduced. What goes unstated is that this approach, even if valid and provable, has at its heart ignoring impacts on local neighborhoods in favor of some theoretical larger regional improvement. Forget that local traffic will be even more soul-crushing than it is now. Forget that local first responders won’t be able to get to neighborhoods fast enough. Forget that local air quality will be negatively impacted. Forget that parking and traffic lanes will be removed causing harm to local businesses. For voters, the most troubling is that some councilmembers have accepted this approach: Region/politics first, neighborhoods last. One of the most frustrating parts of the MP2035 plan is that it is wholly inconsistent with itself and with other City policies, plans and laws. Among these are the General Plan, Community Plans and several up and coming plans. Nothing highlights the hypocrisy better than simultaneous support for MP2035 which admits it will increase congestion (which it counts on to discourage car use) and support for the “Westside Mobility Plan” which labels congestion as the enemy and seeks its reduction. Three days before the council approved MP2035, it approved a motion to extend the $200,000+ contract for the Westside Mobility Plan. Yes, the City is spending money in one place to solve the problems it is spending other money to create. Our tax dollars at work. One interesting admission was made by the City through its planning department and through the council: That it is no longer possible to improve traffic congestion by widening lanes or using other measures. This will come as a huge surprise to developers that have produced environmental impact reports which come to the opposite conclusion. Ironically, these same environmental impact reports that say it IS possible to reduce congestion by making physical changes are universally given a stamp of approval by the City including the Council. Those studies and their traffic conclusions may now no longer be supportable. Fix The City supports improving public safety and improving the quality of life. There is no more basic responsibility a City has than to the life, liberty and pursuit of happiness of its residents. Fix The City strongly believes that a plan that harms first responders’ ability to get to those who need help threatens the lives of the residents of the City. We believe that being caught in ever-increasing traffic jams caused by over-development and now decreased road capacity keeps us prisoners in our cars and keeps us away from our families. Not only does this impact our quality of life and our pursuit of happiness, but it makes pursuing happiness take far longer and far less happy. Fix The City will be pursuing a legal challenge to the MP2035 on multiple grounds towards the goal of having an honest and productive policy which improves the quality of life for all of the City’s residents in all of the City’s neighborhoods. Assemblymember David Chiu proposes a packet of bills to fund transit, flanked by representatives from local transit agencies and advocates. Assemblymember Kevin Mullin is behind him. On Friday, in separate press events in Los Angeles and San Francisco, several members of the California legislature presented new bills for consideration in the ongoing legislative special session on transportation funding. Various estimates put California’s backlog of deferred road maintenance in the $100-plus-billion range. The special sessions, which involve the creation of new committees and a parallel legislative process alongside the regular legislative session, are supposed to get legislators working together on ways to solve transportation issues. Already a long list of bills has been introduced—look for more coverage of the process on Streetsblog as the week progresses. So far the focus has been on how to get money to “fix the potholes,” with Democrats proposing an increase in the gas tax and Republicans calling for putting cap-and-trade revenue towards road maintenance (a ludicrous and likely illegal idea). Now legislators are finally making the connection between public transit—which has its own daunting funding backlog—and the rest of the transportation system. “Anyone who hits a pothole or sits in traffic knows that our transportation system is in crisis, but so does anyone who has to rely on a late, crowded bus to work, school, or do errands, or who would take the bus if one was there,” said Assemblymember David Chiu (D-San Francisco) as he introduced the package of bills. “California needs more transit funding to reduce our greenhouse gas emissions and to prevent gridlock from strangling our economic recovery,” he said. Assemblymember Kevin Mullin (D-San Mateo) pointed out that fixing congestion has to include better transit options. In the San Francisco Bay Area, the major transit systems including BART, Muni, and AC Transit “are at or near capacity already. Increasing capacity of public transit systems must be part of the solution,” he said. The proposed bills would triple the diesel fuel tax, with the money to be distributed to all transit agencies in the state, and raise the portion of cap-and-trade money currently allocated to transit. See below for more details. This was far from the first set of proposals for the special session. Earlier in the week, a “Fix Our Roads” coalition of groups representing cities, counties, and labor groups announced its legislative priorities. These include investing in freight movement, raising revenue from a broad array of options including tax increases and fees, and focusing on maintaining and rehabilitating the current road system. Unfortunately, according to them, adding lanes to fix congestion fits that category. The Fix Our Roads coalition focus points had nothing to say about transit. 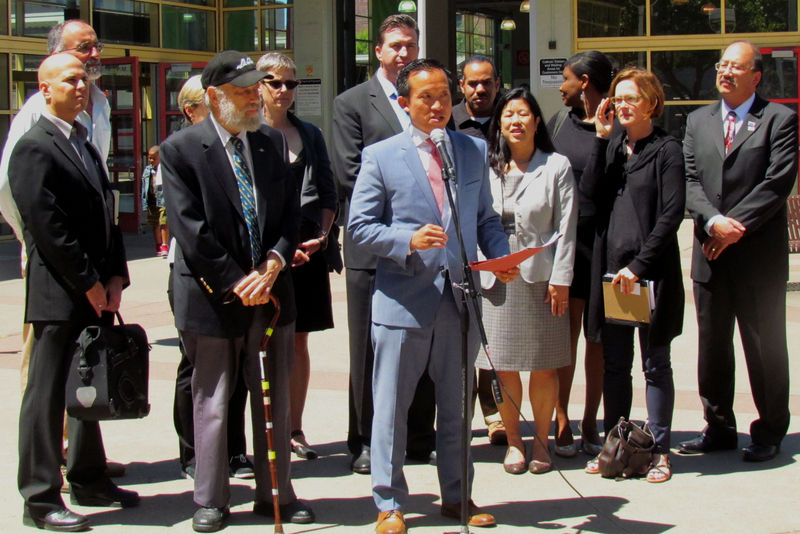 A similar press conference took place in Los Angeles at the same time, featuring Assemblymembers Richard Bloom (D-Santa Monica) and Adrin Nazarian (D-Van Nuys), and Senator Ben Allen (D-Santa Monica), flanked by officials from L.A. Metro and southern California transit advocates. SBX 1-7, from Senator Allen, and ABX 1-8, from Assemblymembers Chiu and Bloom: Both bills would triple the diesel fuel tax to raise $300 million for the State Transit Assistance program. SBX 1-8, from Senator Jerry Hill (D-San Mateo), and ABX 1-7, from Assemblymember Nazarian: These bills propose an increase in the portion of cap-and-trade funds for the Transit and Intercity Rail Capital Program from ten percent to twenty percent, and for the Low Carbon Operations Program from five percent to ten percent. Look for more this week from Streetsblog on the special legislative session on transportation and the ideas it is generating. 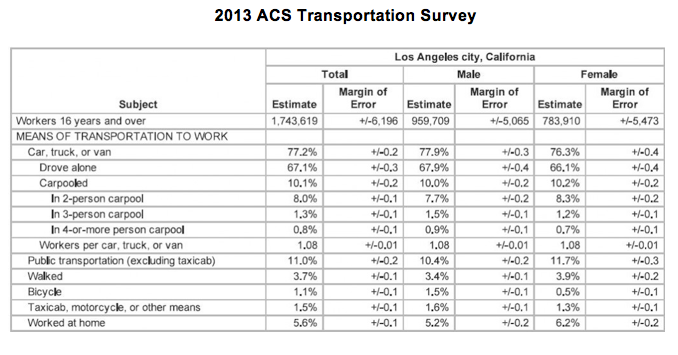 Some Angelenos walk or bike to work, but most of us are getting where we need to go in via bus, train, or car. Every day, 2,000 Metro buses crisscross L.A.’s streets, trains traverse 87 miles of light rail and subway tracks, and—well, then there’s the 405 at rush hour. On the heels of new city plans to add bus and bike lanes, it’s a good time to take stock of the big picture in this big city. What should L.A. look like for pedestrians, bikers, drivers, and transit commuters? And what do we need to be thinking about as we look ahead? In advance of the Zócalo/Metro event “What is the Future of L.A.’s Transit?” we asked a variety of transit experts: What is missing from the current vision of L.A. transit future? It wasn’t long ago when L.A.’s traffic problem called for a single solution: Build more roads. But the world has become so much more complex, crowded, and challenged—financially and environmentally—that today’s traffic solution must solve multiple problems and provide multiple benefits. That requires a multi-modal system, with roads, bus, rail, car- and ride-sharing, scooters and skateboards, people on foot and on bikes—all working together seamlessly with the help of apps developed with local data. Urban real estate is expensive, better put to use for things other than wider roads or bigger parking lots. Moreover, the onus is on the transportation system to address the problems it begets by reducing greenhouse gas emissions, air pollution, and petroleum use. This is why it’s imperative that drivers share the roads with pedestrians and cyclists. “Active transportation” is cheaper and greener than driving, provides connections to transit, and improves public health. People walking and biking on the street also create a sense of community and improve public safety—plus they patronize local businesses. Streets designed for all users move people, not just cars. They can feature wide sidewalks, protected bike lanes, bus-only lanes, and real-time travel information provided at comfortable bus stops. They can be lined with trees whose canopies filter the air and mitigate the heat-island effect. If built with permeable pavement, they can filter and retain stormwater, and the use of “cool pavement” could lower temperatures in neighborhoods. In this context, roads resume their historic role as shared public spaces at the center of local economies and community life. There can be locally owned shops, street furniture, and mixed-use and mixed-income housing so people can live near where they work and shop. Parking structures shared by residents and businesses can reduce housing construction costs. This vision for the future of transportation in Los Angeles is richly interconnected with community life, and so green that it’s verdant. Gloria Ohland works at Move L.A., which aims to build a bigger and better public transportation system in the city. The recently adopted Mobility Plan 2035 for the city of Los Angeles calls to improve the city’s buses with better signal-timing and pre-board fare payment. Regional planning efforts should follow Los Angeles’ lead and recognize that flexible and efficient transit can attract people out of their cars. First, bus service on our city streets needs to be fast, efficient, and frequent. Buses running in dedicated lanes with transponders that trigger green traffic signals, like our Metro Rapid service, could offer a quick ride. Pre-board fare payment with wide doors could allow buses to operate like trains. Most important, L.A. buses need to run frequently to reduce wait times, especially with transfers. We should also operate buses on our freeways, with stations every two to three miles and transfer points at freeway interchanges. The use of dedicated bus lanes or carpool lanes would allow for fast service. Ideally, buses would run every 10 minutes without getting stuck in traffic—a very attractive alternative to getting stuck in the freeway commute. The stations would need to be connected to Metro Rapid service, local buses, bicycle connections, and on-demand rides such as Uber and taxis. Finally, instead of attempting to regulate these on-demand services out of the market, we should find rational ways to allow them to flourish, because they serve our scattered trip patterns better than fixed-route transit. As driverless cars become available, the economics of Uber Pool may even convince many of us to give up our cars altogether. Ryan Snyder is a Los Angeles-based transportation planning consultant and a member of the UCLA urban planning faculty. The county of Los Angeles has embarked on an effort to realize a more connected and “sustainable” city. This vision is anchored by numerous rail expansion projects, and focuses on encouraging commuters to favor public transportation over driving. But where do low-income transit riders—those who depend on our transit system the most—fit into the vision of L.A.’s transit future? In Los Angeles, 75 percent of workers who commute via public transportation earn a household income of $25,000 or less a year. Yet research shows that transit investment often increases housing costs near transit corridors. In Boyle Heights, residents had high hopes for the Gold Line rail expansion and its promise of jobs and street improvements. Fast-forward 10 years, there are four new train stations in Boyle Heights, along with reduced bus service and increased real estate speculation. Now longtime community residents are struggling to live near the public transit they depend upon. Advocacy efforts have pushed the Los Angeles County Metropolitan Transportation Agency (Metro) to adopt policy measures that will encourage the development of affordable housing on Metro-owned land. In Boyle Heights, where residents have fought for years to secure affordable housing near transit corridors, the effort feels like an afterthought. Now, as our region moves forward with the plan to transform many other neighborhoods in a similar way, we don’t have a comprehensive strategy that secures housing near transit for Metro’s core ridership. Supporters of transit investment, public agencies, municipalities, affordable housing developers, and residents of neighborhoods impacted by transit expansion all need to sit down at the same table and create a strategy that puts low-income communities who depend on public transit at the forefront of any vision. Plans for L.A.’s transit future should not prioritize riders who don’t depend on transit over those who use the system out of necessity. To do so would simply continue a for-profit policymaking trend that favors short-term political gains over long-term sustainability in our city. Carla De Paz is a community organizer at the East L.A. Community Corporation, a community development organization that advocates for economic justice for low-income families in Boyle Heights. L.A.’s existing transit system is underappreciated. For $1.75 per ride—less than the $2.25-to-$2.50 fares in San Diego and San Francisco, or the $2 fares in Orange County—Metro connects people to jobs. DASH costs just 50 cents—35 cents if you use a TAP card. Yet these local buses and trains are bargains in part because activists were willing to be pushy. On August 11, 2015, the L.A. City Council approved a Mobility Plan with hundreds of miles of protected bike and bus lanes. It was a strong statement, but it was just that—a statement of policy. Each individual project will have to be approved separately. Some will require removal of lanes of traffic, or parking. So far, at least, politicians generally haven’t shown the courage to make those kinds of tough choices. It’s easy, if you think about it, to let voters decide whether to fund new rail lines and stations. The hard part is asking not for money, but for people to make real change and sacrifice. If you build it, they won’t just come. More trains alone won’t lead to the transformative change L.A. is crying out for. Buses will need their own lanes, and it will have to become easier for cyclists and pedestrians to get to stops and stations. Because space is limited, this won’t be a win-win. Ultimately, we will have to change not just the way we get around, but how we live. Our leaders will have to renew efforts to leverage that multi-billion-dollar investment in transit infrastructure to attract—and approve—transit- and pedestrian-oriented development. This will mean somewhat more density, and more traffic locally, if less regionally. There will be some near-term pain in pursuit of long-term gain. Steve Boland is a senior associate and transit sector lead at the Los Angeles office of Nelson\Nygaard, a sustainable transportation planning firm. He helped redesign the bus system in Santa Monica, and is currently helping to redesign the system in Culver City. There is little doubt that self-driving cars will be on our roads in the not-too-distant future. These vehicles have the potential to provide mobility options to not only the elderly, people with disabilities, and working parents, but to the general population. Automated vehicles might also solve what’s known as “the first and last mile problem” of getting to and from public transit stations. And if these vehicles turn out to be as safe as promised, there will be far fewer accidents on the road. Planners, policy makers, stakeholders, and citizens all need to prepare for this game changer. We need to consider what regulations will be required, along with how automated vehicles could impact everything from our transit systems to greenhouse gas emissions. Will enough jobs be created in the autonomous vehicle industry to compensate for the jobs lost in the transit and transport industries? 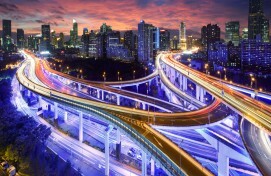 Will new highways, lanes, and parking lots be needed when connected vehicles are common sights on our streets and roads? We need to stay at the forefront of determining what regulations are needed, unlike what has happened with decisions about ride-sharing services. While some regulations will fall to the federal government, car-cultured California—and especially Los Angeles—need to lead the charge. The technological explosion that allows us to share cars, houses, and numerous other things are causing so many conflicts with local governments and communities today. If our elected officials can create a road map to ease this particular technology into our daily lives and shape our long-range plans and goals for transportation and land-use planning, a welcome mat will be brought out for automated vehicles. Sarah L. Catz is director of the Center for Urban Infrastructure at Brandman University, and a research associate at the Institute of Transportation Studies at UC Irvine. The future of transit in L.A. is full of great promise, with five Metro rail projects totaling $8 billion now under construction, and the city of L.A.’s new Mobility Plan 2035 prioritizing transit on key corridors. We’ve experienced record transit ridership levels not seen since the 1950s. Still, we can do better; less than 5 percent of all trips in the region are by transit. We estimate that Southern California will grow by 4 million people by 2040. As we envision our future population’s needs, we should anticipate the housing and mobility preferences of the two largest demographic groups: retiring baby boomers and up-and-coming millennials. We need to intentionally align development with transit to better connect job centers and residential areas. Lastly, we need a dedicated, sustainable revenue source to pay for transit. Hundreds of thousands of Southern Californians depend on transit every day, and this will grow with additional rail and bus service. Making sure we can pay for operations and maintenance is critical to success. L.A. is on the right track for a bright transit future, provided we make strategic decisions that support transit as a meaningful choice for travelers. Hasan Ikhrata is the executive director of the Southern California Association of Governments, the largest metropolitan planning organization in the U.S. Transit has a role to play in reducing greenhouse gas emissions, increasing the availability of affordable housing, and expanding access to well-paying jobs. Local transit investments can also be a powerful tool to promote more equitable access to our region’s economic, social, and natural resources. But too often, we define the success of public transit investments in limited terms. Once new transit lines are running, we look at a host of ridership and operational statistics to measure efficiency and effectiveness. This data is important and useful, but we should also be discussing how to best quantify transit’s wider benefits. Today, increasingly diverse coalitions, including Investing in Place and EnviroMetro, are pushing for local transit investments that yield more socially equitable, environmentally sustainable, and economically beneficial outcomes. With foresight and coordination, transit investments can help connect low-income communities to job centers, healthcare, and educational opportunities. Strategic investments can spur the development of affordable housing, enhance efforts to implement green stormwater infrastructure, reduce the total number of miles we drive, and improve our health by encouraging walking and cycling. But we won’t achieve those broader benefits unless we intentionally set out to accomplish them. Let’s create a systematic approach that sets long-term goals and assigns quantifiable metrics to achieve them. If we’re looking to transform our region by reimagining our transit network, then let’s make ourselves accountable for the outcomes that we want to see. Richard France is a senior associate at Estolano LeSar Perez Advisors, where he assists clients with strategic planning and community and economic development. Mr. France is also an advisor for Investing in Place. We are excited to share with your our public comment letter to Metro with our recommendations for the framework for the potential 2016 Transportation Ballot Measure. And we invite you to sign on and join us! The due date for the letter is September 1st, so we are asking all interested partners to sign on via this google form by Monday August 31st. These recommendations emerged through a series of individual and group conversations with elected officials, policy makers, public agencies and community-based organizations that we have conducted across the Los Angeles region over the past year. It also builds upon much of the momentum that began in 2012 while working with many of you through the Los Angeles County Active Transportation Collaborative – which advocated increasing funds for active transportation. Investing in Place was created to respond to what we began to realize during our work with the Collaborative, that increasing funds for active transportation wasn’t an isolated goal but rather as the entry point to expanding our focus on improving neighborhoods and communities. It became about finding ways to employ a collaborative model to help stakeholders deploy funding in a manner that achieves social equity, public health, and environmental policy goals. And we hope this framework just does that! Develop a data-driven framework that prioritizes funding for projects that advance social equity, enhance public health, and achieve environmental goals. Better serve transit-dependent populations by maintaining low fares, increasing frequency of service on high-ridership lines, ensuring funding for transit operations, enacting policies that enable development without displacement, and supporting integrated housing and transportation initiatives. Supporting Meaningful and Authentic Participation during this process. Please join us and sign on today! We also encourage our partners to submit their own comment letters on framework ideas to Metro. The deadline is September 1st and letters should be sent to Metro CEO Phil Washington. If you do submit a framework letter – please send us a copy, we’d love to highlight it. We encourage partners to feel free to borrow/be inspired by language from our framework letter and/or see our policy brief on Active Transportation Finance that documents research and recommendations for why we recommend 10 percent of the potential 2016 measure to go towards funding active transportation.